This year’s recipient is Lord Martin Rees. 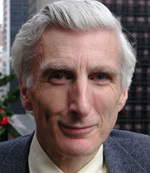 Lord Martin Rees is Royal Society Professor at Cambridge University, a Fellow of Kings College, and the U.K.’s Astronomer Royal. The winner of the 2001 Cosmology Prize of the Peter Gruber Foundation, he has published numerous academic papers and books including Our Final Hour: A Scientist’s Warning: How Terror, Error, and Environmental Disaster Threaten Humankind’s Future In This Century  On Earth and Beyond. Other books by Lord Martin Rees include Just Six Numbers: The Deep Forces That Shape the Universe, Our Cosmic Habitat, and Before the Beginning: Our Universe and Others.